Viva Food celebrates luscious food and seasonal produce. Each returning season brings its own tastes and pleasures. From the delicate flavours of summer fruits and salads to the robust aromas of winter’s soups and home made pies – enjoy a year of seasonal cooking. 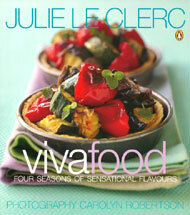 This book presents an inviting collection of Julie’s recipes from her popular weekly column in conjunction with Viva and the New Zealand Herald.